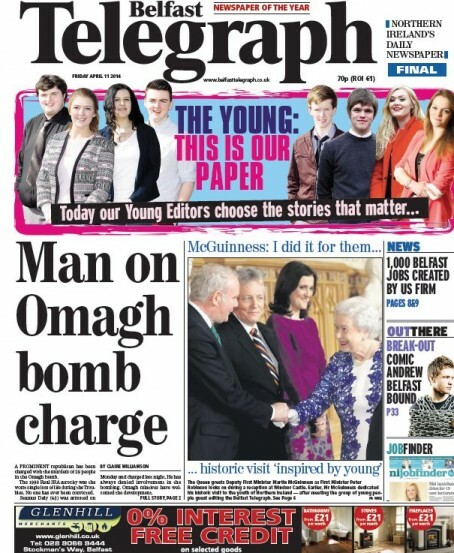 Eight school pupils got their hands on the tiller at the Belfast Telegraph when they got a chance to edit the paper. The teenagers spent five days at the newspaper, as part of a special campaign on Northern Ireland’s young people. The likes, loves, hopes, aspirations and fears of 16-24-year-olds was the focus of a week-long editorial crusade. The campaign kicked off with an exclusive opinion poll that revealed that two thirds of Northern Ireland’s young people want to build their future outside the Province. The eight school pupils wrote a string of articles after carrying out a round of interviews and other activities. Included on their schedules were interviews with First Minister Peter Robinson and Deputy First Minister Martin McGuinness, a visit to a parliamentary committee, interviews with local sport stars, a day with the Lord Mayor of Belfast and a trip to the top of Harland and Wolff’s famous Samson and Goliath cranes. They also got a peek behind the scenes of Belfast’s Titanic tourist attraction and a top theatre as well as compiling news stories, video reports, vox pops, blogs, fashion reports and much more. The eight were guests on Stephen Nolan’s BBC Radio Ulster show to discuss their week in the media and the results for the Belfast Telegraph opinion poll. They also got the the chance to edit the paper with the students – four boys and four girls – getting access to all the decision-making meetings. Further details and the opinion poll results are available here. If they chose staff/freelance pictures over sent in rubbish or even original copy over press releases then they have done a darn better job than the paper I work for. Good on them. All that on the front page is old news (ie it’s already been on telly). Why not let Belfast pensioners have a day at editing the paper as they are more likely to buy it? …Don’t answer that, I know, a load of crumblies is not the right PR image. There, how about that…and I’ve never ever been to Northern Ireland! Most local papers look like they were written and laid out by kids, so what’s new? Since when did work experience become news? An desperate, unimaginative gimmick to try a stem the flow of readership losses.